Description: This bench is a beautiful addition for your outdoor decor. Made from cast aluminum, the bench features meshed pattern throughout and intricate details on the crown of the chair backrest. The antique copper finish is neutral to match any outdoor furniture and will hold up in any weather condition. Whether in your backyard, patio, deck or garden, you'll enjoy this piece for years to come. 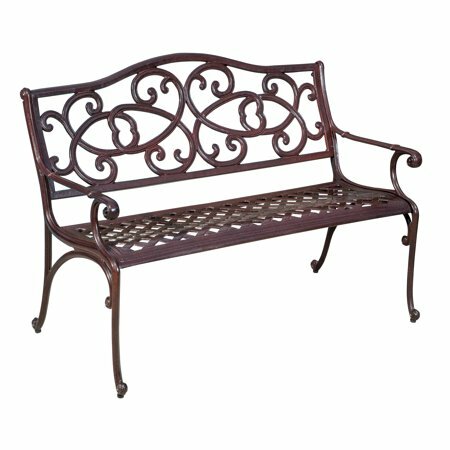 This bench is a beautiful addition for your outdoor decor. Made from cast aluminum, the bench features meshed pattern throughout and intricate details on the crown of the chair backrest. The antique copper finish is neutral to match any outdoor furniture and will hold up in any weather condition. Whether in your backyard, patio, deck or garden, you'll enjoy this piece for years to come. Enter the details of an online store that carries UPC 637162770603 below. The store's URL must go to a valid product page that has the product displayed with pricing information.